Jay Cassell brought us a very compelling slide show of his trip to Saskatchewan last month. Jay's story is one of those that put "Canada Trip" on the agenda of every whitetail nut. And, of course, photos like the two that follow keep the fire burning hot. The first photo is of a buck shot by Scott Yetman a guide for Diamond Willow Outfitters in Alberta. The story is that Scott was enjoying a day behind the gun when this monster buck appeared. Though it has not been officially scored, early reports is the buck is in the 190-range. 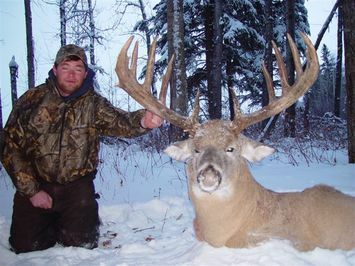 And here is another Alberta buck, this one shot by Helgie Eymundson. The freakish non-typical is rumored to be in the 280" B&C (non-typical) range, and the official score is supposed to come out by the end of this month. We will report the net score as soon as we hear it! I've just returned from a hunting trip to Alabama, which has greatly reduced my life expectancy, mostly because of what I ate. At home, I stick to a balanced diet of pizza, cheeseburgers, beer, Doritos, chocolate bars, and one dessert a day: a single serving of ice cream consisting of however much is left in the carton. Alabama hunters consider this a vegan diet. We rolled out of our bags each morning and immediately nuked two or three Jimmy Dean sausage-egg-cheese-and-more-sausage biscuits apiece. We washed this down with Dr. Thunder, an off-brand carbonated beverage that lives up to its name. As sitting in a shooting house burns untold calories, we loaded our pockets with more Dr. Thunder and peanut butter crackers before heading out. Lunch began with grilled homemade sausages (plain, jalapeno, or jalapeno-and-cheese) made by Jimmy, who excels at fixing trucks, reloading bullets, and cooking. We ate these hot and dripping fat with our fingers while he deep-fried bass filets, deer medallions, and breaded chicken bits. Halfway through the meal, which we ate standing around a fire in a 55-gallon drum, someone produced a loaf of white bread. The slices served as plates for food too hot to touch, as napkins when you tired of wiping your hands on your pants leg, and had the added benefit that you could eat them. Dinner was at a restaurant that served fried dill pickle slices as an appetizer. Most of us went for the 17-oz. ribeye with hush puppies and, for the vegetable, french fries. We washed this down with beer. Then, because it is impossible to eat while you are asleep, we had slivers of cheesecake with a molecular density similar to that of uranium to tide us over until dawn. The guys invited me to come back next year for the annual barbecue on the last weekend of the season. "We get serious about it then," one said. "Damn near stop your heart up like a rusty watch." If I'm alive, I'll be there. 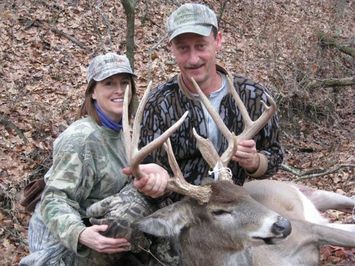 Bea Walmsley gets the Hunting Spouse of the Year Award from Buck Tracker. Bea and her husband Tim live in Illinois and hunt on a gorgeous farm that they own. Astute readers may remember Tim from two BuckTracker appearances this fall; "the Bucks of Illinois" spread we did, as well as an individual spot I did on Tim when he killed a monster buck back in November. Well while Tim was chasing that buck, Bea was after a huge buck of her own. She actually had two encounters with the 12-point below this fall, and both times she came whisker-close to killing him with her bow. One shot was a clean miss, and a few weeks later she shaved hair off his back with a second arrow. The buck raced by Bea at Mach 3, chasing a doe fawn that had come into heat. The action happened so quickly that she never had time to grab her bow. But Tim, hunting nearby, did. 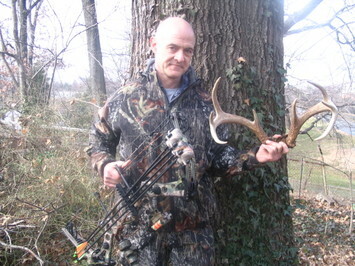 When the toad buck stopped the chase 20 yards from his stand, Tim made the shot count, and Bea's deer switched owners. Congrats to both Bea and Tim, and thanks for sharing this great story with us. Though Bea toughed out the rest of the Illinois season in some nasty, frigid weather, her tag went unfilled. My theory is she's built up huge karma for next fall...so I'm reserving special space in BuckTracker for a picture of her trophy! It's lunchtime for Timmy Armstrong and his stepfather is cutting up prepared venison for the little boy. Deer meat is the only solid protein that the six year old can stomach. "I say I'm on a diet, I can't eat a lot of food," Timmy said. Timmy has eosinophilic esophagitis, a disease that is relatively new to doctors. It is characterized by an intense inflammation of the esophagus associated with allergies. Last fall, I was 20 feet up an ash tree in western Kansas, hoping to ambush a whitetail buck. That night I got a rare chance to watch a real predator--a big tom bobcat--pester the small band of does that fed into view. The cat definitely had those nanny-does nervous, but as soon as a buck showed up, the situation changed. The buck stomped toward the cat, clearly intending to boot him into the stratosphere if Mr. Bob made any serious moves at a whitetail dinner. It was an awesome show! On that note, please read the story that follows. 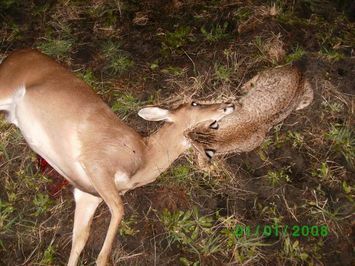 It comes to us from a reader who, like me, was lucky enough to see a bobcat putting the sneak on a feeding doe. Only this time, there was no buck to act as her bodyguard! I got a letter from a Mr. R. L. Fischer of Pittsburgh the other day, passing on the transcript of an interview in which the subject delivered “the best justification for hunting” that Fischer had ever heard. The person being interviewed was a non-hunter, the Pulitzer-Prize-winning Food Column editor of the L.A. Weekly, Jonathan Gold. And it aired on every hunter’s favorite radio outlet, National Public Radio. That’s right, a food writer from La-La Land on the liberal elite’s favorite radio. Gold, an adventuresome eater, described both his extreme discomfort and a kind of epiphany he had while eating a live prawn in a Korean restaurant in Los Angeles. “...it was not dead, this prawn, it was extremely alive and it was wiggling its legs and it was wiggling is antennae. And its eyes were like swiveling madly in its eye sockets, and it was looking back at me, seeing me as actually the predator, the creature that was going to eat it. The interviewer then asks the million dollar question. Was Gold of the opinion that it mattered, that it was morally better to eat an animal if the eater was more awake to the fact of the animal’s life and that it had had to be killed to end up on his dinner plate? I was thinking about this all day yesterday while butchering my deer, which took me and a friend about five hours. It was something I hadn’t done in a long time. It brought home to me once again the strange miracle of our lives: of the fleeting now-ness of them, of the violence of existence, of the vividness of any given moment as it flies. And of how all living things are part of a mystery far beyond our ability to comprehend. It’s not unusual for big bucks to slip into bow range unheard. In fact, they don’t approach any other way for Daniel Myers of Sioux City, Iowa, who arrowed a 182 7/8-inch 14-pointer this fall. Myers, you see, is deaf. In sign language, Myers uses his hands to show "horns" atop his head. He then wipes his chin and finishes the statement with a sign of thumb and pinkie outstretched. "Buck. Best. Ever," his daughter Jenny Christophersen interprets. "He's hunted for 20 years and this is the best he's gotten. He couldn't wait to see how it scored. It's better than he thought." 2007 has been a memorable season for many whitetail nuts, but for BuckTracker readers, it may well go down as the Year of the Lockup. Sure, we've shared great deer hunting stories, ogled giant bucks, oohed over albino whitetails, argued over garage-lot mulies, and even chuckled over grizzly bears on scout cams. But let's face it, for some reason we've been bombarded by images of whitetail bucks that tangled with each other...and couldn't get unlocked. First we had the Boldings and their dramatic rescue of a South Dakota whitetail. Then we had the Tiger Ridge incident, where a WI hunter shot one of a pair of bucks tangled up with each other in a creek. And a North Dakota woman who saw a pair of bucks locked up in field, came back the next day, and shot one. And now, my friends, this. 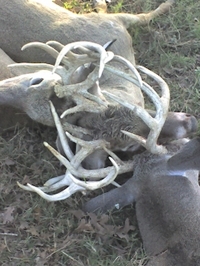 Twice in the last three days the following image of not two, but THREE whitetail bucks with horns hopelessly meshed has found its way to my inbox. Is this image photo-shopped or posed? Possibly. Could such a thing actually happen? I have no doubt that it could. At this point I have no way of knowing if these pics are a hoax or simply record one of the goofiest freaks of nature I've seen in awhile. Regardless, I thought Buck Tracker readers would appreciate the irony of yet another entry into the strange fall of 2007. Anyone know anything about the origin or validity of these photos? Hunting success and I meet up so seldom that I hardly know what to do when he stops to shake my hand. I was 22 feet up in a tree and looking down a ridge at about 8 o’clock on a Saturday morning. It was mid-December, a notoriously difficult time to see bucks, and I had no higher hope than a shot at a doe. Then came the shuffling in the leaves behind me. I turned to see, 20 yards out and closing, a buck: big shoulders and curved tines. There was no time for counting points or guessing his spread. The binary switch in my head just flipped to “shoot” and I clipped release to string. I’d never seen him before, but he was obviously familiar with the area and knew exactly where he wanted to go. And his path would take him right behind me. Five seconds later, he passed within 10 feet of my tree. Five seconds more and he was quartering away at 15 yards. I drew, let him make it to an opening in the brush, and gave him my best bleat. You should understand that my best bleat sounds like a goat choking to death on a fan belt. But it did the trick. He stopped. I shot. The divot from his leap was a shovel’s worth of black dirt lying atop the wet leaves. The blood trail was continuous, six inches wide, and a full 120 yards long. I have no idea how he made it that far missing that much blood, but he did. I am incapable of aging deer once they appear to have reached the age of 3 1/2, but he looked every bit of that and maybe more. That’s a trophy in my book. 2. Hope that he offers a clean shot before you have time to fully realize exactly what’s going on. Some deer hunters—including my friend and colleague Bill Heavey—do not appreciate scouting cameras. I happen to think they’re pretty cool, and I can trace this attitude to my childhood, when I was something of an espionage freak. All spies were cool, and those who hid little cameras in picture frames and pieces of fruit were using the ultimate surveillance tool. Most folks who dislike scout-cams think they give hunters a technological edge, allowing the scouter a critical glimpse into a whitetail’s life that will aid in the harvest of the buck. In my experience, just the opposite is true. I rarely get pictures of the deer I know I’m hunting. Instead, I’ll snap a nighttime pic of some behemoth buck using my stand tree as a scratching post, and this blurry image will be the only glimpse I’ll ever get of the deer. Photos like these are humiliating, not enlightening. Anyway, I love to look at trail cam pics, and I’d love for Buck Tracker readers to submit some of your favorites. They can be from this fall or season’s past, great big deer or interesting little ones. Heck, some of my favorites are those without a deer in them. Need proof? Check out the bears that showed up on this “carcass cam,” placed near the carcass of a muley buck (you can see them after the jump). Pretty cool stuff, for a little spy camera!